You see the word “ceili” in our name and wonder “What is that? How do you say it? Can I even do that?” Yes you can! Here are answers to some of the questions you may have about ceili dancing and just how fun and easy it can be. 1. It’s easier to pronounce than it looks! Irish ceili dancing is the traditional group dancing native to Ireland, first taught by tradition and then, in 1939, put into writing by the Irish dancing commission. The dances we teach are those generations-old dances handed down through the years, as well as newly developed original choreographies. 2. There are 30 “by the book” ceili dances! You’ve probably heard the tune before! Here’s Irish band The Corrs playing a version of it! 3. You can go beyond the book! “These dances are the essentially the dances of Ireland,” American folk dance ethnologist Elizabeth Burchenal explained in her 1925 publication “Rinnci na h-Éireann: National Dances of Ireland.” The book pre-dates the formation of the Irish dancing commission and documents 25 dances, including nine dances that don’t appear in Ar Rinci Ceili. At Bluegrass Ceili Academy, we’re excited to bring these nearly century old dances back to life, just as I did with Fionnala, a four hand dance done to reel music, when we debuted the dance with my previous school. 4. Ceili dancing isn’t just for kids! Performing onstage with the New Century American Irish Arts company in Washington, D.C. I started learning Irish dance as a 27-year old adult, and am living, dancing proof that it isn’t just an activity for children. It’s a great activity for all ages! That’s a perspective I bring to my teaching style – pairing the fun of learning dance, with the thrill of performing and even competing. 5. Ceili can be competitive! Competing in ceili dancing can be thrilling! Ceili dances are the foundation of competitive team Irish dancing. 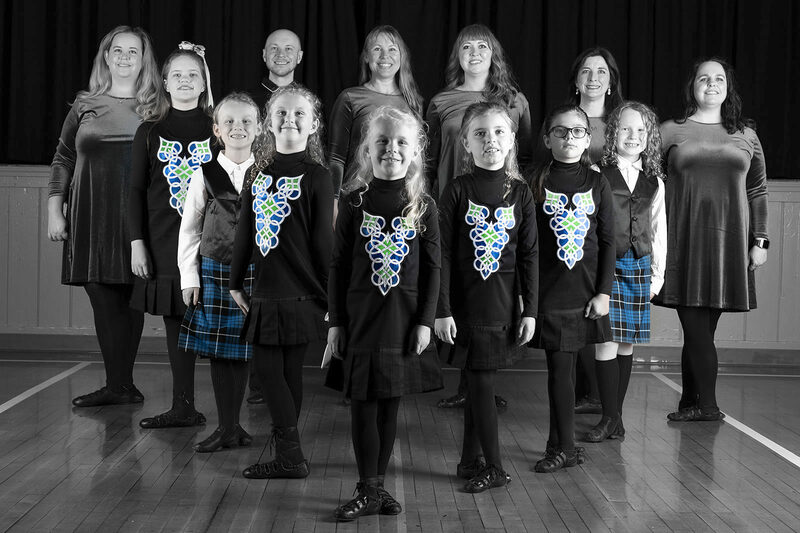 Ceili dancers in pairs or groups of three, four, six or eight perform precisely choreographed movements at local, regional, national and international competitions by age group. 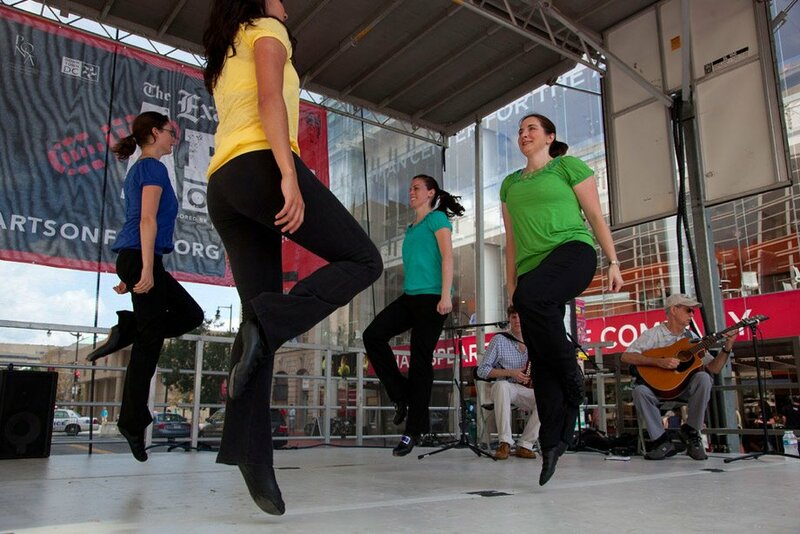 Ceili competitions are a great team building experience – every team member equally contributes to the team’s success. And when a team is successful, they can go far! 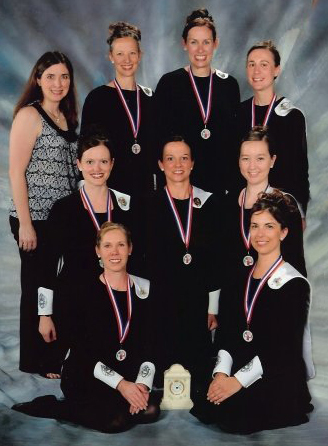 Since 2004, the teams I’ve coached have won 23 regional championship ceili titles and, in 2009, the North American national championship. 6. Ceili can be original! Creativity is key when you’re choreographing ceili dances. While “the book” dictates the dance moves to be performed for certain competitions, every teacher interprets them differently. Developing original choreography for small or large group dances for performances can also be a group project – some of our best moves come from dancers figuring them out on their own. I love listening to Irish music. Sometimes, a tune comes along and inspires you, as was the case with the “Drums of Belfast” by Scythian. Hearing the tune inspired me to choreograph a dance to go along with it… a dance that we’ve had the honor to perform at the Kennedy Center in Washington, D.C., AND live with the band! 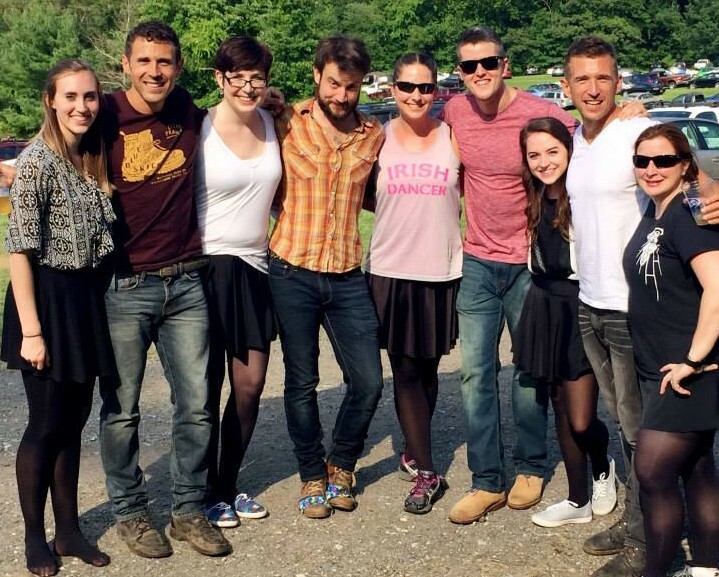 Hanging out with Scythian at the Annapolis Irish Festival. 7. Irish ceili dancing is, afterall, social dancing! Ceili dancing takes its name from where you’ll see these types of dances the most, at a ceili, a community event with live music and dancing. Many of the dances you’ll find in “the book” are progressive, meaning you’ll dance it first with one set of people, and then progress on through the line to additional sets of people. It’s as if you’re encouraged to be social by meeting and dancing with multiple partners during the course of a tune. 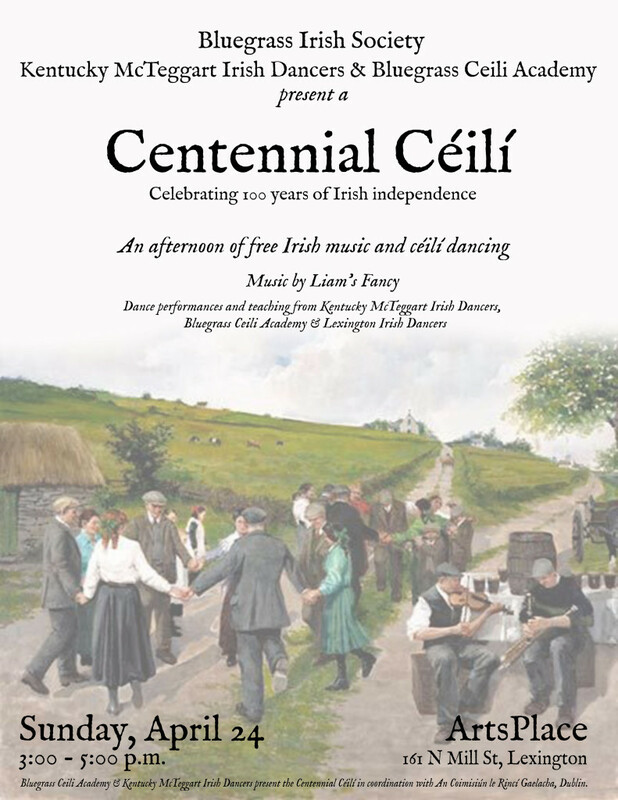 This April 24, Bluegrass Ceili Academy is joining with the Kentucky McTeggart Irish Dancers and the Bluegrass Irish Society to host a Centennial Céilí in celebration of 100 years of Irish independence. The Irish dancing commission in Dublin is encouraging its’ members to come together all across the world to participate. In Lexington, we’ll be hosting our FREE community event in the performance hall at ArtsPlace, 161 N. Mill Street, from 3 – 5 p.m. I’ll be teaching some of the “not by the book” dances from Elizabeth Burchenal’s “Rinnci na h-Éireann.” There will also be performances and teaching by McTeggart and the Lexington Irish Dancers. Visit our Centennial Céilí page for more information or click on the image below to download and share our flyer! Sign up for periodic email updates from Bluegrass Ceili Academy. You can also connect with us online via Facebook, Twitter and Instagram — be sure to follow us for our latest updates. ← Join us for Central Kentucky’s Centennial Ceili!